G7x is a wireless personal safety and lone worker monitoring device that connects workers to real monitoring personnel using 3G cellular and the Iridium satellite networks. Connectivity is complemented by two-way text messaging, providing critical insights on G7x’s brilliant LCD screen in the event of an emergency. Devices automatically watch over workers and call for help, even when the employee can’t. G7x provides situational awareness enabling teams to respond with all the information necessary for optimised rescues in hazardous environments. Should G7x experience a fall, no-motion, gas exposure or a missed check-in, assisted-GPS capability guides responders directly to the effected worker’s location. All safety incidents are communicated to Blackline’s live monitoring teams who can mobilise responders to an employee’s exact location or trigger scalable evacuations in real-time when required. G7x leverages G7 Bridge portable satellite and 3G base station, which switches seamlessly to satellite connectivity should cellular become unavailable. G7x communicates with G7 Bridge via an industrial-quality 900 MHz radio link from up to 2 km away. 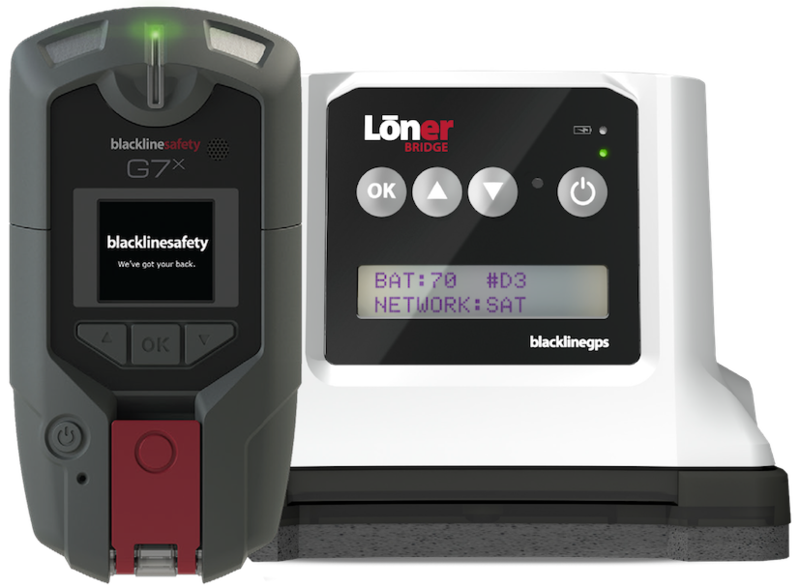 G7 Bridge communicates with the Blackline Safety Network and monitoring teams using 3G or satellite connections.